Hillary Clinton maintains her lead over Donald Trump after sweeping the general election debates Wednesday, with a healthy plurality of voters naming her the winner of the final presidential discourse. According to a new POLITICO/Morning Consult poll, the first national post-debate survey, 43 percent of registered voters said the Democratic candidate won, compared with 26 percent who opted for the Republican Party’s standard bearer. Her 6-point lead over Trump among likely voters is unchanged from our previous survey: Clinton still leads Trump 42 percent to 36 percent in the race for the White House, with Libertarian nominee Gary Johnson taking 9 percent of the vote and Green Party candidate Jill Stein slotting in as the top choice for 4 percent. Clinton’s 17-point margin of victory in the final debate was up 3 points from the town hall-style forum weeks ago, but still not as wide as the first debate, when voters backed her by a 21-point margin. 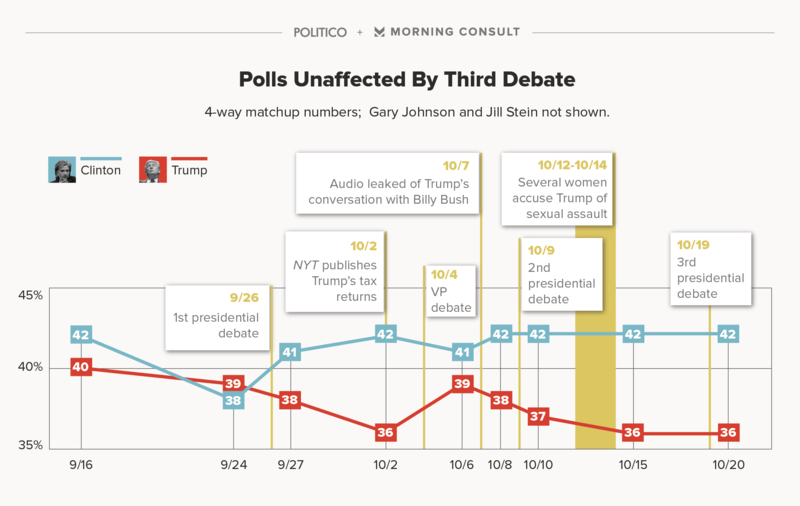 Six in 10 voters watched the debate, the same as the second but down from the first debate (viewed by 68 percent). As Election Day nears, voters are viewing the debate performances with lesser importance. Roughly half (49 percent) said the debates were important to how they vote, compared with 62 percent of voters who said it would be important after the first debate in late September. Praise was plentiful for the debate’s moderator, Chris Wallace of Fox News, in the immediate aftermath of the contest, and voters also say he gave a better performance than his peers. Media bias has been a prevalent subject during this campaign, and half of voters said Wallace’s questions were fair and impartial. That’s several points higher than CNN’s Anderson Cooper (43 percent) or ABC News’ Martha Raddatz and CBS’ Lester Holt (40 percent each, respectively). 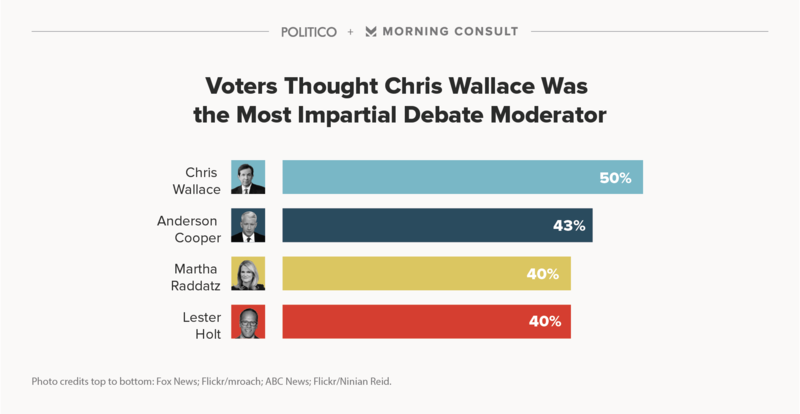 Just 13 percent said Wallace’s questions were more favorable toward Clinton, compared with 40 percent who thought Raddatz and Cooper — who moderated the second debate — were biased toward the Democrat. A little more than one in four (27 percent) thought Holt was biased toward Clinton. The biggest headline to come out of the debate was Trump’s refusal to say he’d accept the results of the election, regardless of who won, and a supermajority of voters think he’s wrong on the issue. Seven in 10 (68 percent) voters said the losing candidate should accept the results, with just 14 percent dissenting. In terms of candidate support, Clinton backers were much more likely to say the losing candidate should accept the result. 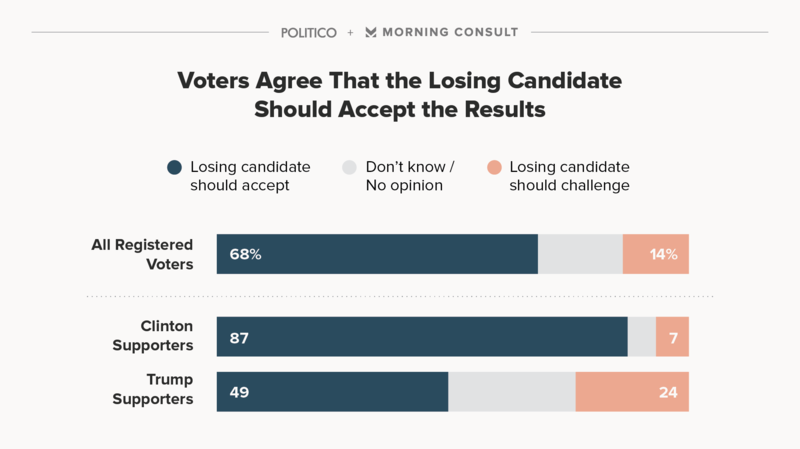 Almost nine in 10 (87 percent) of the Democrat’s supporters said the loser should accept the result, compared with just under half (49 percent) of Trump voters. 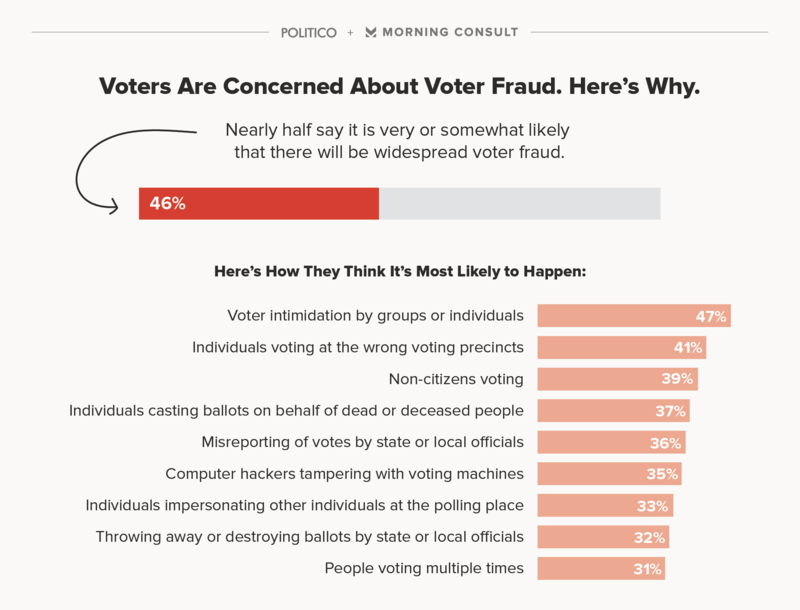 That sentiment from Trump supporters is very likely tied to what they perceive to be a “rigged” election that could be stolen from their candidate, as Trump has said time and time again throughout the presidential campaign. Eight in 10 (81 percent) of Trump supporters said last week they thought the election could be stolen from them due to widespread voter fraud. The talk of a “rigged” system and widespread voter fraud has been alarming to a number of down-ballot Republicans who have sought to tamp down suggestions that the election could be stolen from their ticket topper. As Clinton’s victory starts to look more likely, strategists have suggested that such talk could depress turnout from the base. Some GOP politicians might then find solace that about one-third (34 percent) of voters says they’re more likely to support down-ballot Republicans if they knew Clinton would win, compared with 24 percent who said it would make them more likely to support a Democrat. The survey polled 1,395 likely voters and 1,598 registered voters from Oct. 19-20 for a margin of error of plus or minus 3 percentage points. View the topical questions and the trend questions.